…into a new medium, awakening into Spring(! ), awakening from the hibernation of busy season! 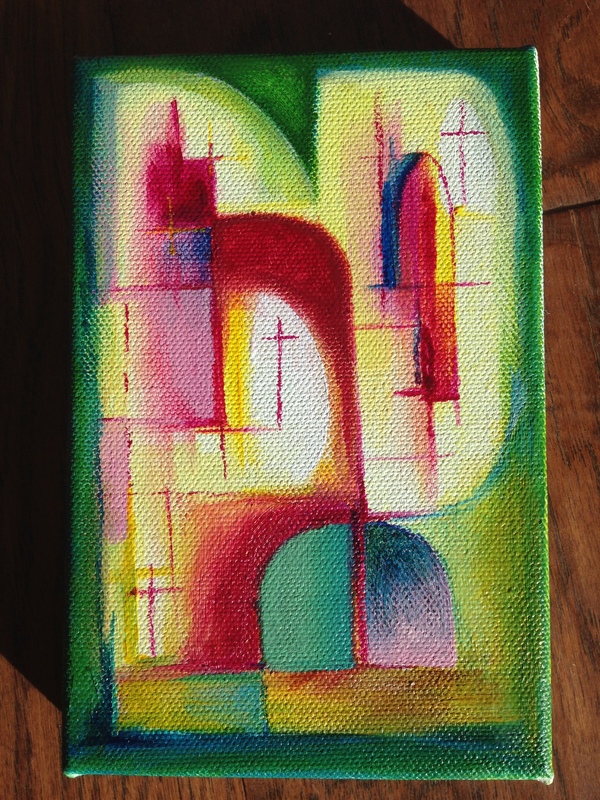 This one is acrylic on a 4 x 6″ triple-primed cotton canvas. I’m getting used to working on canvas, and starting to really enjoy it! I decided to buy some large ones on clearance! Not sure when I’ll feel ready for them, but looking forward to that day on the horizon. I hope both hemispheres are enjoying seasonal warm breezes and the beauties of spring and fall today. What a wonderful world! Peace. Thanks so much, Kathy! It started out as one of my window series and then it … turned into something else completely. It was an interesting journey. Really glad this one speaks to you! My first thought was church stained glass. Striking colors with sunrise shining through! Lovely, Laura! Thanks so much, Carol! It seemed to transform into cathedral windows before my eyes. Totally not planned. So glad it’s giving you that feeling. Thanks for letting me know! I am crazy about that! Love the melding of colors and the light that seems to shine though. Thanks, Kirk! Always looking for the light. This one really took a turn I didn’t expect…..but I was pleased at the end. I’m pretty sure I’ve not spent as much time on anything I’ve made as I have on this one. Really glad you enjoyed it! It does remind me of a church window. Beautiful colors. Thanks, Carmel! It was lots of fun! Really enjoying acrylics (which I resisted for over a year)! Oh Laura – This gives me goosebumps! This is so beautiful! It speaks to me. It sings! It shouts to be heard, but in a quiet, peaceful way. It speaks of faith and freedom and opening up to joy. Absolutely stunning! I am overwhelmed. What a beautiful journey you are on. Jodi, thank you so much! You are filled with such kind, encouraging words always! Really glad this speaks to you, as it started as one in my windows series (grids) and became…..something flowing and peace-filled, something else completely. So glad you enjoyed it, and thanks as always for your wonderful encouraging words, my GRAND friend! Very peaceful and the light pulls me into your painting. Canvas adds a whole new dimension for blending your paints, enjoy the fun, Laura. I’m do happy to see you back! It’s so much fun to explore new art supplies. Good price on the canvas! Thanks! I’ve never really shopped for them, but it seemed like a great buy to me. They have 20 x 20 right now at just over $5! Again, seemed like a steal, so I snatched some up. I too love the colors. I feel like I’m looking at a cathedral stained glass window. It’s beautiful! Thanks so much, Deborah! I’m so glad it gives you that feeling! Jill, you are such a kind human being. Thank you so much! It is so weird that you mentioned Oaxaca, and I can’t remember, did you post photos of any of those churches on your blog when you returned? Because in my mind, while I was painting, I kept seeing these old, old buildings and old churches, and I’ve never been to a country where the churches truly are as old as the buildings in my mind were. So I don’t know where these images were coming from. Wow, I’m so cool that this translated and that this is what you see in this painting! Really thrilled about this. Thank you, Jill! It was truly a joy to create this one, and even though it’s only 4 x 6″ (I thought about you soooo many times, and how bold and large you paint), it took me a long time to make this! I would guess roughly six hours, maybe more? Over a couple of days. It was so much fun though! I’m so glad you enjoyed it! Thanks, Snehal! It was a joy to create! I love the trips into my mind and imagination that abstract work sends me on. Thanks, Jill! Yes, definitely meditative. At times I had to come out of my trance to make decisions, and I don’t think I’ve actually thought more about any other painting I’ve done, but when I was in the zone it was very trance-like and cool. Really enjoyed it. This canvas is beautiful. I see a letter of the alphabet each time I look at it. I see the letter P or the letters PD together. Love It!! Thanks, Jade! My sister is an artist, and saw letters too! That is so cool! I’m so glad you enjoyed it! You’re too kind! Thank you so much, Teresa! 😀 So glad you enjoyed it! Great vibrant colors. I especially like the “doorways” (or window ways!) into the depth of the painting. I’ve been neglecting my drawing too. Hard to fit everything into the day! gosh Laura, everyone has said it all! many musicians Beethoven,Bach, etc, heard the music play in their head and then wrote it. so when you say you painted what you were envisioning – that sounds just about right to me! Thanks, Debi! It was almost surreal at times! Usually I use a reference, but the abstracts are strictly instinct. I never know what’s really going to happen when I get to the “end”. Do you feel that way about your abstract work, or are yours more planned? oops. did you say this is a 4 inch by 6 inch image? if so, I am even more impressed. Thanks so much, Denis! I feel like I really can’t take credit because this one had its own mind and almost seemed to create itself! Thanks, but I feel the same way about your quilts!!! You’re doing amazing stuff! Awwww thanks you made my day! Love the color combination – nice job! Thanks Frank! It’s small, but this one took longer than anything I’ve made yet!